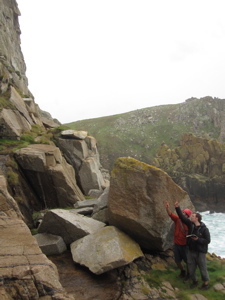 Many thanks to Len for organising an excellent weekend of climbing down in Cornwall, at Bosigran. 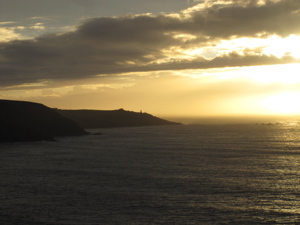 I took the sleeper train down to Penzance on Friday night, leaving at 11:45 pm and settling into my bunk pretty much straight away managed to sleep nearly until 7am in the morning, to be woken by a much appreciated bacon butty and a pot of coffee. A quick taxi ride to The Count House, a mug of strong coffee later and we were ready to have a crack at some classic routes. We started with Doorpost a 56m graded Hard Severe. 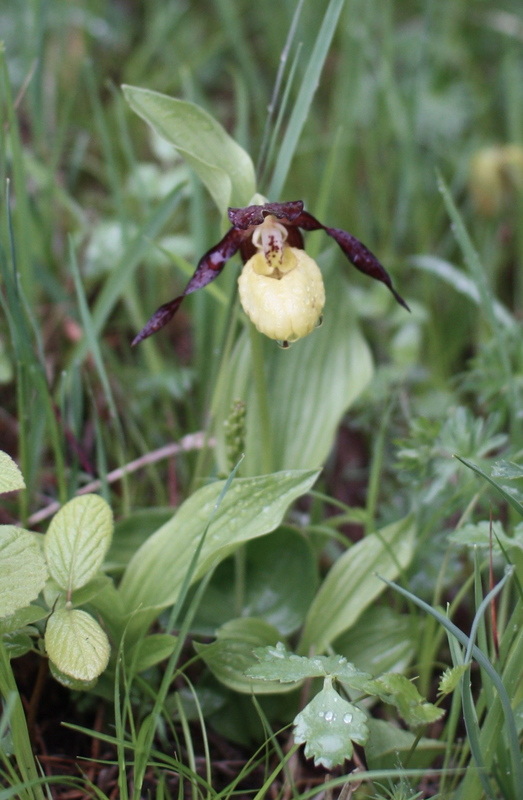 It's recommended as three pitches (18m 4a, 12m 4b, 26m 4a) although we combined the last two pitches. This is an absoloutey classic route - 3*, starting with a traverse across to the first pitch, then heading up the left hand of the two cracks. (Len and James then did the top section of Anvil Chorus, which I declined - discretion and valour and all that). For dinner we walked to the nearby Gurnard's Head a meal marred slightly by the fact that the kitchen was allegedly having some problems, and whilst they were serving food, they couldn't offer us anything more than chesse platters and chips, and they weren't offering their normal discount for climbers that night. The excellent pints of Tribute in very good nick was a bit of a saving grace, but I wouldn't recommend the place. On Sunday, with the weather looking a bit more variable we headed out to do Ledge climb - 52m Very Difficult in four suggested pitches (9m, 20m, 14m, 9m) which we did in two, combining the first two and second two pitches. Another classic route (1 *) with an interesting start and a long traverse to the stance. From there it's a slither up a chimney, then out onto the very distinctive ledge and up and over the top. (Len and James then did Little Brown Jug, which I declined). Exhausted but happy we took the train back to town, enjoying a fantastic sunset on route.. Taking a bit of a chance on the weather, Jules, Andy and I headed up to the Peak District to walk the first two days of the Pennine Way. 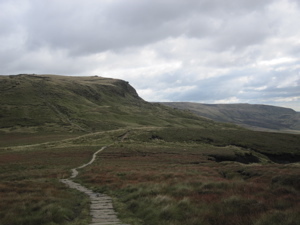 We took the train to Edale on Friday night, and then walked to Marsden over the course of Saturday and Sunday. After a hearty breakfast at the Ollerbrook farm we set off up Hope Valley and then up onto Kinder Scout, following the (well signposted) Pennine way. The weather was quite kind to us, mostly bright and sunny, albeit with a chill to the wind. 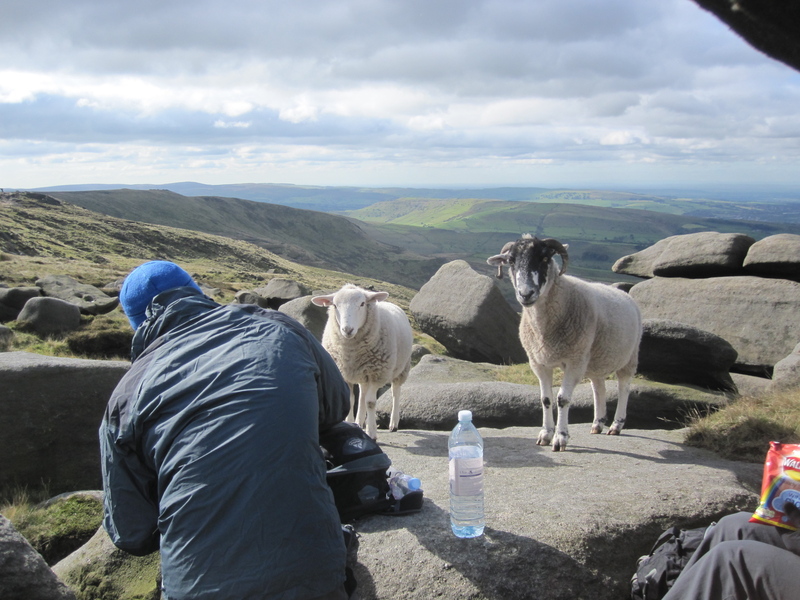 We soon warmed up on the climb up to Kinder scout where we stopped for lunch, and entertained some local guests (as shown right). After lunch we crossed Featherbed Moss and climbed up to Bleaklow before starting on the long and hard descent to Torside (with a chorus of "where's the pub" from the critics growing in volume with each mile). We arrived at the Old House B&B happy, tired and well deserving of a great pint of Webster's Bitter. All in the walk took us just shy of 8 hours, for the 15 miles. Day two started with a walk up past Laddow rocks (not the highlight of the walk for those not so comfortable with heights) and on up to Black Hill. 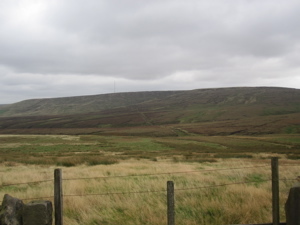 From there, the walk continued down past the reservoirs above Marsden, and into the village proper. All in the walk took us about 5 ½ hours for 12 ½ miles. Our main holiday of the summer was cycling the last quarter of the Danube Radweg (cycleway) from Vienna to Budapest, followed by a couple of days relaxing and exploring Budapest itself. We had hoped that this would be a gentle, traffic free cycle ride along the river as it winds through Austria, Slovakia and Hungary, in bright warm sunshine. Unfortunately the weather had other ideas, and we spent more time in waterproofs than we would have wished for! The start of the route out of Vienna to Bad Deutsch Altenburg was quite pleasant, following the river, and taking the smallest ferry that you'd ever expect to get a bike into. Robert came with us on this section (which was great) and took the train back to Vienna, so he got to enjoy the hail storm (in August ?!?) with us. We then spent three full days exploring Budapest, and even managed to get some shopping in! We throughly enjoyed the city, it was a great combination of pretty buildings, good food and service, and not too busy to feel crowded or rushed. Day 1: Vienna - Bad Deutsch Altenburg (57.8 km, 5½ hours in total). Robert had a puncture in his rental bike which we repaired next to a fishing lake. Hail! Lots of rain in the morning, sunny in the afternoon. Day 2: Bad Deutsch Altenburg - Halaszi (76km, 7¼ hours). Raining and cold all day. Stopped in Bratislava to buy waterproof trousers for Jules. Tough long day. Day 3: Halaszi - Gyor (46km, 2 hours). Very cold (7ºC) and raining hard all day. Unpleasant cycling, arrived very early in Gyor and slept in the afternoon. Day 5: Tata - Estergom (62km 5¼ hours). Road cycling, mostly not too busy except for last section. Dry and overcast. Basilica of Estergom very impressive, viewed in the distance. 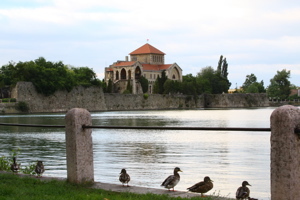 Day 6: Estergom - Budapest (88km, 8¼ hours). Great weather (at last!) sunny, calm. Mostly cycle paths and off road with 3 ferry crossings. 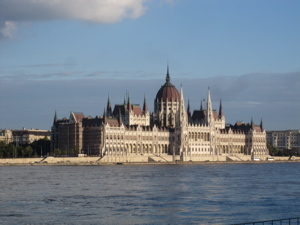 Very impressive entry to Budapest, Parliament building in late afternoon sun. Unnecessary hill to hotel! 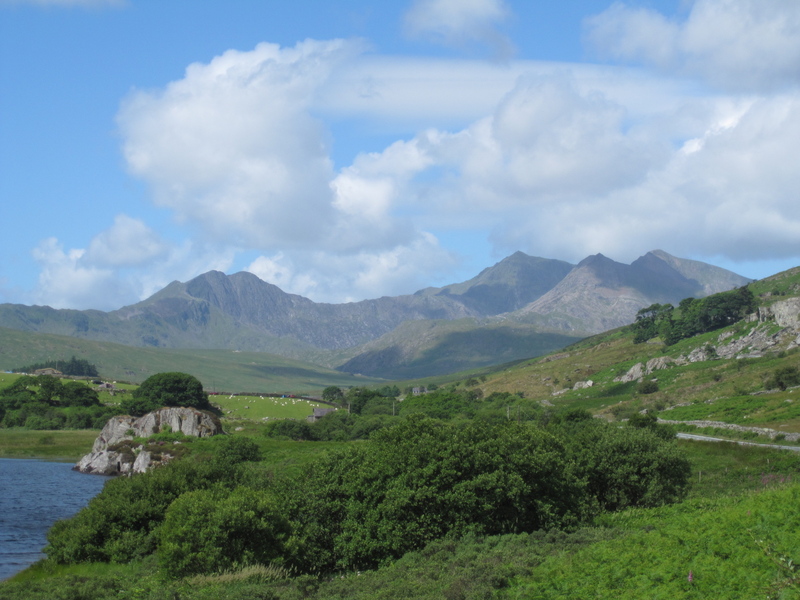 Jules and I finally got around to doing our long-planned trip to Wales, with a long weekend in Snowdonia national park. The journey up was pretty easy - we caught a fast train to Chester then rented a car for the remainder of the journey (we figured that was the most time and effort efficient way of getting there), which worked out pretty well. On the way up we stopped in Llandudno, and did a circuit round the Great Orme headland, partly to stretch our legs and partly because the weather was absolutely fantastic. 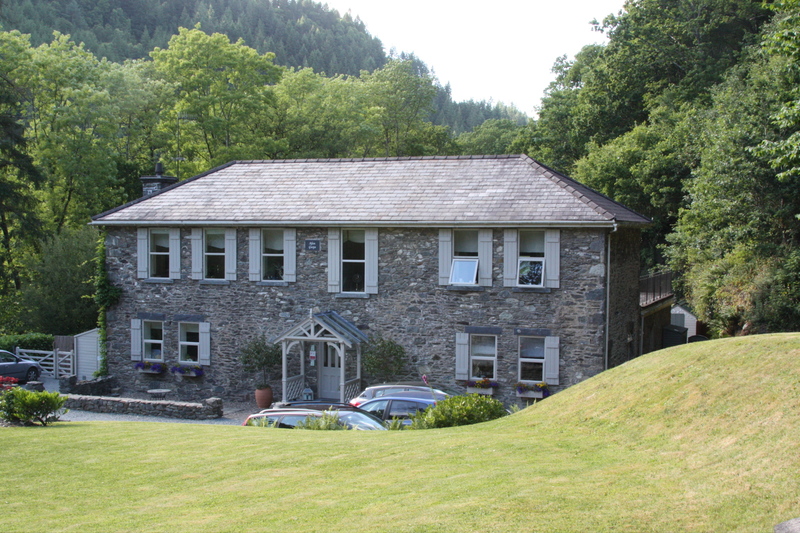 We stayed at Afon Gwyn country house, a very pleasant little B&B where we were very well taken care of by Tim, Di and Holly, and a place we would thoroughly recommend. On Saturday we climbed Snowdon, taking advantage of more great weather. 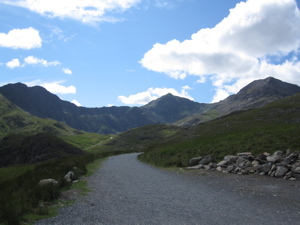 We went up the Pyg track, and came back down the Miner's track, following the advice in Carl Rogers' "Mountain and Hill Walking in Snowdonia", Volume 1 (a very useful guide). The ascent took us 2hrs 20 minutes, and the descent took 2 hrs, and we reached the bottom happy, and in pretty good shape. On Sunday we rented some mountain bikes and I had a go at the Marin trail - a grade red, 28 km, 450m VG route starting and ending in Betwys-y-coed. This was considerably more technical than I'm used to (a little more rugged than the South Downs), but was a great experience, and good fun. I finished pretty mucky and had to go an sit down in the river in order to get myself clean enough to go home and have a shower! 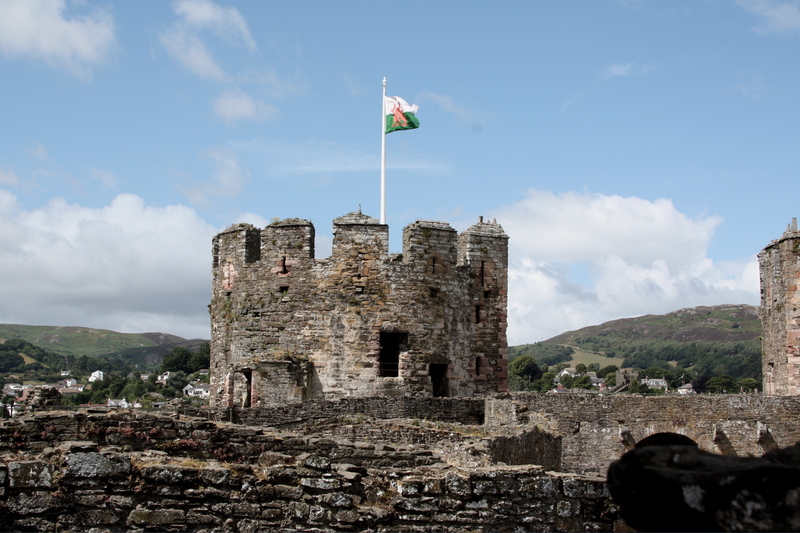 Feeling slightly exhausted, but well rested and happy, we began the journey back on Monday, stopping off in Conwyn to visit the castle and the town before catching the train back to London from Chester. I joined the boat on the second leg of it's circumnavigation of mainland Great Britain, from Falmouth to Oban, with a stop-over in Dublin. 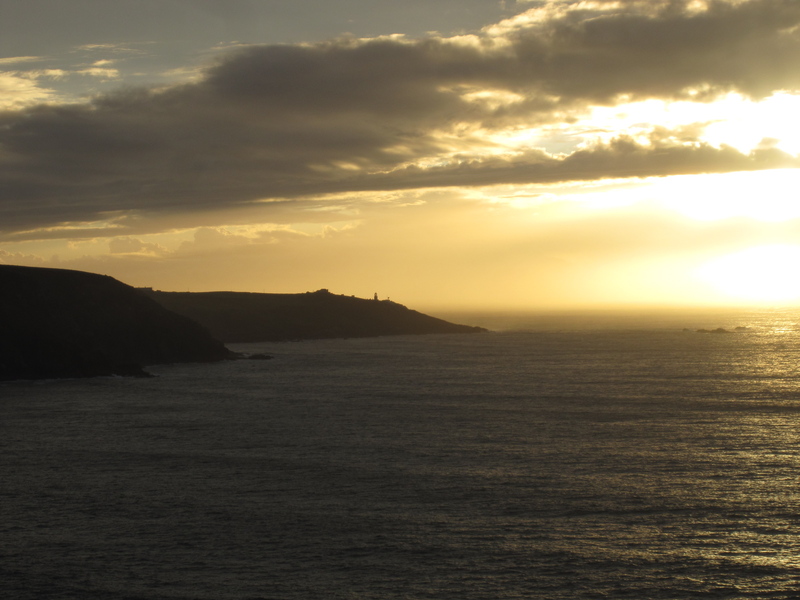 We completed the journey in three parts - the first being continuous (watch) sailing from Falmouth to Dun Laoghaire, just outside Dublin. I have to confess that I wasn't feeling particularly well for this leg of the trip, just about managing to stand my watches whilst leaving anything technical to Dad and Peter! This leg was a bit of a slog, especially round Land's End, but this was more than made up for by the dolphins, of which we saw three pods, on different occasions. We were grateful to arrive in Dun Laoghaire (where Judith joined the boat), a very well protected harbour, and must give a special thank you to the Commodore of the Royal St. George Yacht Club (est. 1838), Mr. Patrick Blaney, for making three visiting yachtsmen feel very welcome indeed. 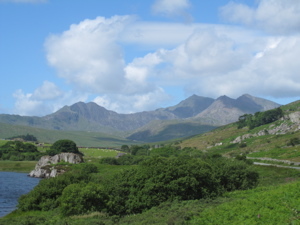 We were laid up in Dun Lagohaire for two days, awaiting slightly more favorable winds, then headed up the North Channel for the second leg of the journey. We stopped off for a few hours in Ardglas (much fun entering the harbour at 2:30 am with the segmented leading lights turned off - I assume someone forgot to put the 50p in the meter) for the first night, and anchored just off Muck Island the second night, before making Port Ellen on Islay on the third morning. We stayed for just a little while in Port Ellen (where Rod joined the boat), just long enough to stretch our legs, have a warm shower and a night down the pub & curry, and a quick tour around Lagavulin Distillery the next morning before heading off. 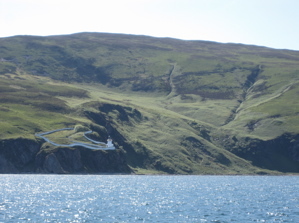 From Port Ellen, it was day sailing and anchorages up to Oban for the third leg of the journey. 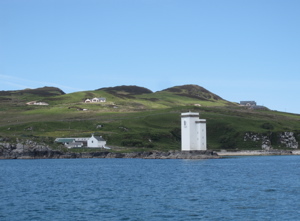 The first day we passed up through the Sound of Islay, and found a small anchorage in West Lock Tarbett on Jura. The next day we headed up to Seil Island, then down to another lovely anchorage in Cuan Sound. Lastly, we headed up and into Oban, staying in the Kerrera marina, which was unfortunately out of water for showers (something of a priority after three days on the boat). All in all, it was a pretty good journey, although the winds were less than co-operative at times. We could reasonably have hoped for Westerly or South-Westerly winds for the majority of the time, but actually the prevailing winds were North or North-Easterly for most of the two weeks. Still never mind, it's all good fun, with plenty of Whiskey to keep us going! 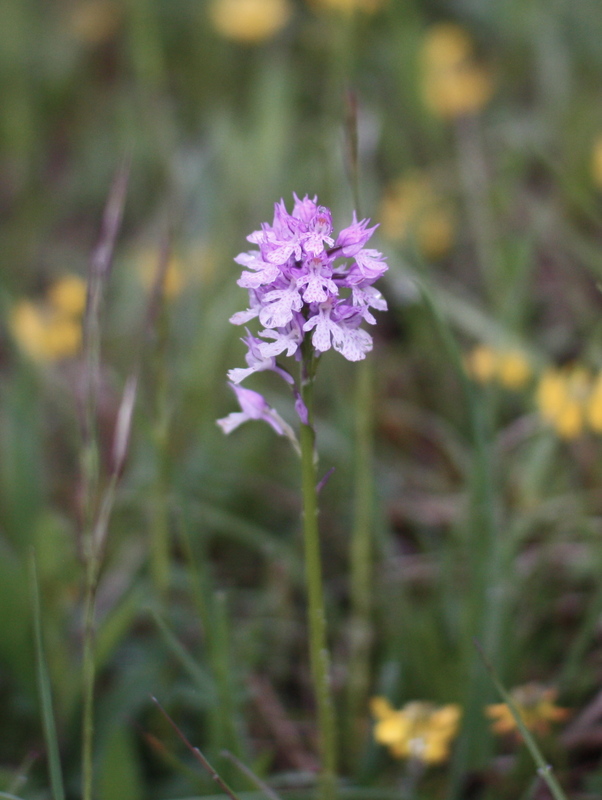 This year the annual (35th, I'm told) orchid walk was timed to coincide with Jules' father, Andreas' 60th birthday, so we headed over to Jena to join in the walk, and the celebrations. We flew to Berlin, and spend the morning looking around the town (it was my first time there). 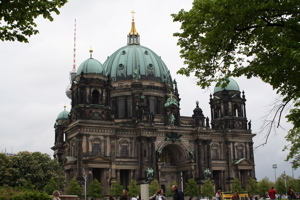 We flew into Tegel airport, and took the (quick and easy) bus transfer to the centre of town. We walked through Brandenburger Tor and down Unter den Linden, past the Berliner Dom (left) and the television tower before collapsing into Alexander Platz for lunch! In the afternoon we took the ICE train to Jena (about 2 hours) finally arriving in the hotel at 19:30. The next morning, after an early start for Jules (not long after 9am) we set out on the walk. Many thanks for Albrecht for checking out the walk and spotting the best sights ahead of time, and for taking such good care of us during the walk. 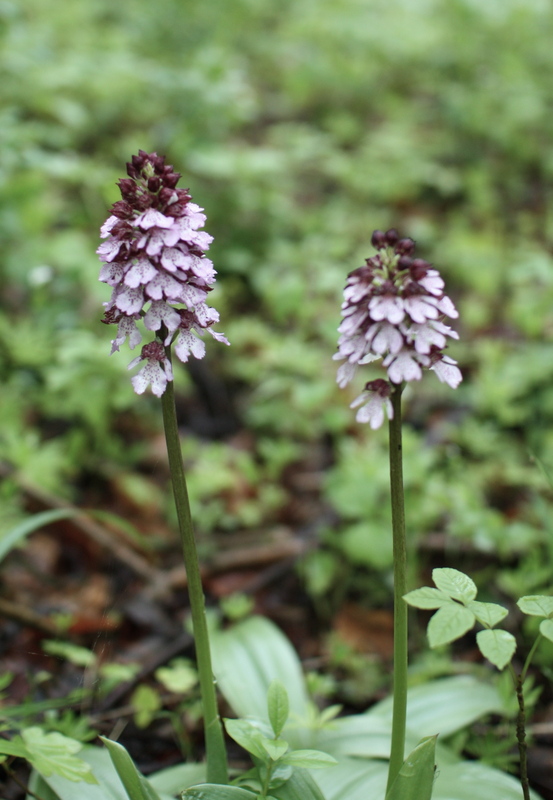 We saw a good selection of Orchids on the walk (click on the thumbnails to show a full-page image), although I suspect it's going to take a bit of effort to find out what they are!). 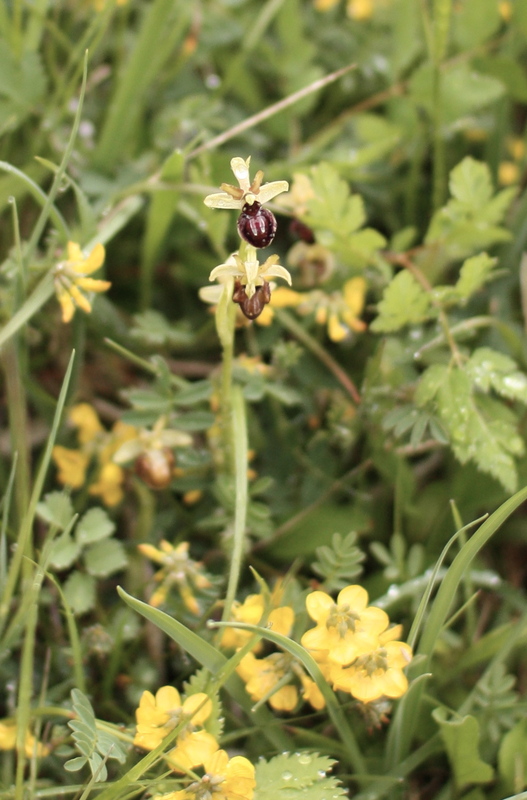 The route itself was a 12km round trip, taking in one hill, and the weather was overcast, with slight drizzle. I wish I'd taken my gators, and Jules wished she'd taken her waterproof trousers (actually I wish that she'd taken those) and better shoes, rather than the air-cooled Merrels. 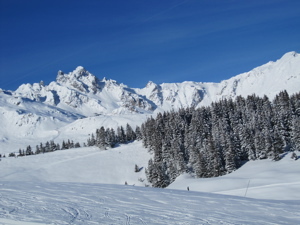 The second skiing trip of the 09/10 season was a week in Les Trois Vallées. Andy and I pulled our usual trick of waiting until the last moment before booking, partly to make sure that the snow was good, but also to take advantage of the last minute deals. The gamble kind of paid off this time, we ended up paying a pretty reasonable price for a room in a very large chalet (actually more of a hotel) in Courchevel 1650. I had two concerns about "Les Avals", the first being that 1650 is right over the side of Les Trois Vallées (making it a long way to get over into the other valleys), and the second was that the chalet didn't get particularly good ratings. It turns out that the former fear was completely misguided. The slopes above 1650 have good skiing, and the connections over into Meribel and beyond are as good (in fact probably slightly better) than from 1850/1550. The concerns over the chalet reached a bit of a peak when the coach pulled up outside, and I realised that the only British bar in 1650 was actually part of the building. Andy and I were very grateful to have a room at the back of the building, which was a lot quieter than those people unfortunate enough to have to try to sleep over the bar.... Otherwise the chalet was fine. It was a bit cheap and cheerful, and the food wasn't all that great, but the people (and staff) were very friendly, and given that we were definitely there for the skiing, we've got no real complaints. The snow was pretty good for the week, but on a number of days the cloud was quite thick and low, which led to bad visibility. On the other hand it also meant that the slopes were nice and quiet, and so Andy and I got to spend most of our time off-piste, playing in barely-touched powder, which was great, and good practice for a type of skiing that can be hard to find. We spent a decent amount of time in the slopes above 1650, where there is really good, gentle, off-piste skiing, with few hazards, and short queues for the lifts. On the days we felt like going further afield, we generally ended up above Val Thorens, and eating lunch at La Folie Douce, accessible from Goitschel (black) or 3 Vallees 1 (chair) - which we'd thoroughly recommend, a nice modern restaurant, with clean & crisp lines and good, reasonably priced food - a full plate of excellent food for ca €15, which we both had trouble finishing. As per usual with the two of us, the focus was on full days of skiing, rather than partying. We did manage a couple of glasses of wine after the meal, but it's fair to say that we didn't exhaust the nightlife, even in Courchevel 1650! 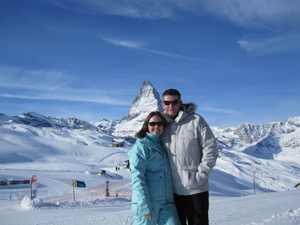 The first skiing trip of the year was combined with Marcus & Wendy's wedding, held in the (beautiful) resort of Zermatt. Those of us skiing headed over on Saturday, whilst those just attending the wedding mostly arrived on Wednesday. The week started well, with great weather and good conditions for those braving the slopes (and trying to remember how to move with 5 ft long feet). The resort has a good selection of beginner runs, with enough off-piste nearby to make life interesting for the more adventurous. 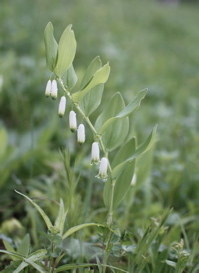 The only disappointing day was Tuesday when we decided to make the trip up the Klein Matterhorn, a combination of three cable cars which took us nearly two hours to navigate, then only to find that the weather wasn't best for viewing! 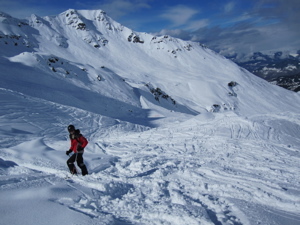 Still, a rapid descent was great fun, and we event managed to get JP on a black run (knowingly, I might add). The wedding was on Thursday, and despite some concerns over the weather, it turned out to be a beautiful day, with the sun breaking through and clouds blowing/forming on the top of the Matterhorn. The ceremony itself was held in the small chapel at RiffelBerg (you can just see it over Wendy's shoulder in the photo), about 200 yards from the train stop, across the piste (a bit of a challenge, for those not on skis, i.e. all of us, but we all made it without incident). After the ceremony and pictures, we all took the train down in to the village, and onto the reception at the aptly named Beau Site Park Hotel, for a fondue and Raclett dinner, followed by more cheese than anyone could eat! 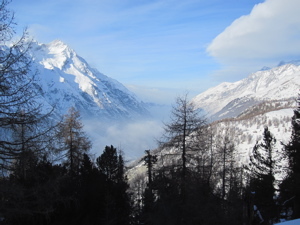 On the last day, Jules and I forsook the trains and veniculars and walked up the hill (actually, that'd be a fully fledged mountain) from Zermatt to Sunnegga - that's 670 metres vertical gain - for lunch and then back down again for a well deserved beer and dinner.